Whenever casting a large horizontal expanse of concrete expansion jointing is needed particularly where the concrete interfaces with perimeter walls and concrete columns. Traditionally soft board has been used for this application. Soft board, however, has a number of disadvantages as it swells when in contact with water, is difficult to cut with precision and deteriorates and becomes unsightly over time. Expanded polystyrene however has none of this problems and thus makes an ideal expansion jointing material. Polyjoint is a range of pre-cut sheets of expanded polystyrene 10mm thick x 1,2m long of varying heights - 170mm, 255mm and 340mm to suit different standard slab depths. Polyjoint is supplied in standard packs of 122 meters. Based on slab depth and size of slab to be cast pre-determine quantity and size of Polyjoint required. Place Polyjoint where required and if needed to be held in place before casting the slab use an EPS adhesive to glue the Polyjoint to the supporting wall. Around column bases wrap the Polyjoint around the column and hold it in place with masking tape. Supplied pre-cut Polyjoint is supplied precut to the slab depth to be cast so no cutting is required on site. Expanded polystyrene does not expand or deteriorate when wet so no excessive jointing compounds are needed to seal expansion joints. Polyjoint can be readily cut with a knife or hand saw to fit the exact dimensions of the slab to be cast. Polyjoint will not deteriorate over time leading to unsightly gaps in the concrete. 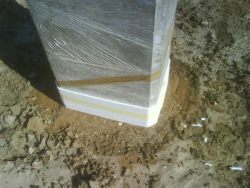 The Polyjoint panels can be glued in place with an expanded polystyrene adhesive or taped around columns to hold them in place prior to pouring the concrete. Polyjoint is supplied in corrugated cartons containing 100 x 1,22 pieces = 122 meters.